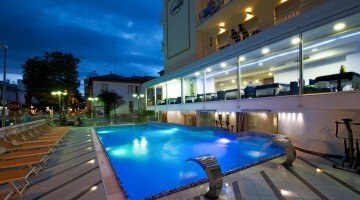 Hotel Lido , a 3-star superior hotel in Cattolica near the sea, is characterized by a large heated swimming pool with hydromassage and services for children including baby bottle and cook exclusively dedicated to children. It has private parking, garage, WI-FI throughout the entire hotel and free shuttle to the train station and the airport. Admits pets of all sizes. The hotel is located in Cattolica on the pedestrian promenade of Via Dante Alighieri, parallel to the seafront. The beach can be reached on foot in a couple of minutes, the center with Piazza Primo Maggio and its dancing fountains in about 10 minutes. The rooms are equipped with balcony, independent air conditioning, direct dial telephone, WI-FI connection, magnetic card entry, 22 '' slim LED TV, safe, minibar not stocked, bathrooms with shower, hairdryer and courtesy set. Different types of rooms are available. SUPERIOR : double, triple and quadruple rooms equipped with bathroom with shower, most of them with hydromassage. PAOLO AND FRANCESCA SUITES : two-level room with large terrace with a 4-seater mini pool and panoramic sea view, modern bathroom with two-seater shower, magnifying mirror, 40 "LED TV, safe, WI-FI, coffee maker, line courtesy with slippers and bathrobe. LA MAISON LIDO : in the annex next to the hotel, larger rooms are available, for the most part family, with all the services listed. FAMILY ROOM : two connecting rooms separated by a large bathroom with hydromassage shower box, able to accommodate up to 6 people. Each room is equipped with a 22 "TV. Swimming pool with children's area and hydromassage, surrounded by sunbathing area, free use of bicycles, wellness area, terrace, bar, reading room, lift, beach towel and bag, free shuttle service to the station, welcome drink on Saturday and Sunday, theme nights . PARKING : private, fenced and guarded by shuttle (included in the All Inclusive formula), or in a garage near the hotel, available upon reservation for a fee. PETS : all sizes are allowed, at a cost of 50 euros per stay, for final cleaning and sanitation. BREAKFAST: buffet with sweet and savory dishes including fresh stuffed croissants, cereals, single portion yogurt, fresh fruit, bread, biscuits, cakes, eggs, cheeses, cold cuts and much more. LUNCH AND DINNER: three menus to choose for lunch and dinner with meat and fish specialties, accompanied by salads, appetizers, side dishes and homemade desserts. VARIATIONS: gluten-free, vegan and vegetarian dishes available. In the hotel : baby room with games, entertainment, mini club, large assortment of strollers for free use, bicycles with child seats and bicycles for children. On request: baby sitter. In the room : cribs, camping beds, bath tubs, lights, safety rails. At meals : baby menu, equipped kitchen open 24h with cutlery, bibs, placemats, pots, microwave, fridge, sterilizers, bottle warmers, high chairs and lockers with the key, a cook dedicated exclusively to younger guests, afternoon snack. At the beach : swimming pool, mini club, baby dance, live entertainment. The garden hosts a large infinity pool heated by an eco-compatible system and with two different depths, therefore also suitable for children. It is equipped with lounges with a lumbar hydromassage, two cervical waterfalls and underwater lighting with LED lights. Surrounded by a sunbathing area with loungers, it offers water aerobics classes with an animator. The hotel has an internal Spa with a hydromassage pool, a Finnish sauna, an emotional shower, a Turkish bath and a relaxation area. A glass of prosecco is offered and a kit with a bathrobe and slippers. Admission is upon payment and upon reservation. 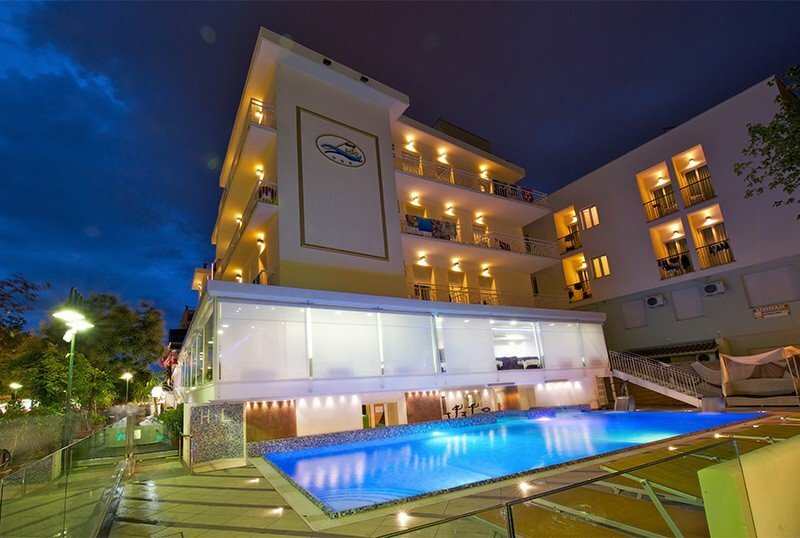 The hotel has an agreement with the Lido delle Sirene beaches n. 78-83 and Bagni Marcello n. 76-77, equipped with swimming pool, hydromassage, mini club, fitness corner, entertainment, group dances, muscle toning, live entertainment, baby dance and pedal boat rental. Prices are per person per day in full board for a minimum stay of 7 days. - All Inclusive Special: for stays from 14/04 to 30/05 and from 10/9 to 30/9 the All Inclusive formula is included in the full board price for a minimum of 7 days. - Special dietary needs must be reported to the booking. - The special family discount does not apply in case of odd stays of one of the members. - Reservations must be accompanied by a deposit of € 150.00 per room to be paid by postal order or bank transfer. - In case of cancellation (within 15 days of arrival), you will not lose the deposit, because you will have the possibility to recover it by staying in one of the 5 Tombarihotels structures by 31/12/2018. From 15 days before the beginning of the stay the loss of the deposit. - For early termination of the stay, the cost of three nights will be charged. Book your 2019 summer vacation first! Hurry up and book your beach holiday 2019! If you book before April 30, 2019, you will receive a 10% discount, valid for stays of minimum 5 days in Full Board. Special Offer in May and June in All Inclusive, starting from € 42.00 per person per day. Children with 2 adults FREE! 3rd and 4th bed 50% discount. SPA wellness center with free daily admission. Take advantage of the special packages we have prepared for Easter, for you and your family in Full Board + water and wine with meals! Children from 0 to 2 years € 15 per day. Come to Cattolica to spend your holiday on April 25th. In full board formula, starting from € 55.00 per person per day. Request a personalized quote without obligation. from 2 to 31 May, in Formula All Inclusive, starting from € 42.00 per person per day, for a minimum stay of 3 days. If you stay for a minimum of 7 days, children up to 14 years of age, in a room with 2 adults, are FREE! Special Offer for the month of June in Cattolica! Min stay 7 nights, in Formula All Inclusive, starting from € 49.00 per person per day. Children up to 14 years in room with 2 adults are FREE! Super promotion for July and August in Cattolica. Stay of 7 nights in All Inclusive starting from € 69.00 per person per day. 3rd and 4th bed -50%. Super promotion for the month of July! From 6 to 31 July, 7 days in All Inclusive Formula starting from € 69.00 per person per day.